Vermont is home to some of the most glorious natural scenery, available for your viewing pleasure four seasons of the year. One of the best ways to explore it is to get outside and blaze a trail. So put on your sturdiest shoes, pack some snacks … and get moving. 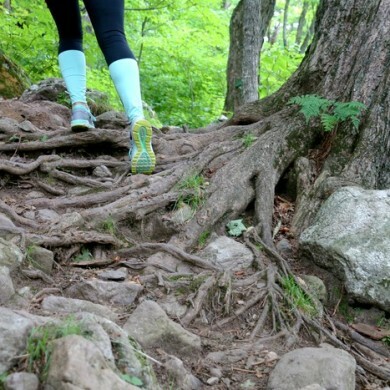 We’ve rounded up our favorite Killington hikes, just minutes from the lodge. Deer Leap Trail is just a deer’s leap from our hotel, a 15-minute drive. Bonus: You can park next to McGrath’s Irish Pub, and pop in for a pint after your trek into the woods. Listed as an intermediate level hike, it’s 3.1 miles from bottom to top and back. You’ll find people of all ages and energy levels along the trail, so don’t feel rushed. Just go at your own pace and enjoy the view. There is a main path, but serious climbers can choose a more adventurous option. You’ll feel at one with nature here. Birch trees line the trail, where many woodland creatures make their home. We saw baby squirrels, bunnies, birds, dragonflies and a caterpillar. Depending on your speed, this hike can take about an hour each way. Views from the top are amazing. You’ll see Pico Mountain, Killington and the Blue Ridge Mountains. Mountains in every direction, as far as the eye can see. The perch from the lookout makes you feel as if you’re on top of the world. This is a picture-perfect spot for picnics, so pack one. The trail is somewhat groomed, with wooden bridges and rock steps to ease your footing. If you want a local guide, consider calling Steve Lulek with Vermont Adventure Tours. 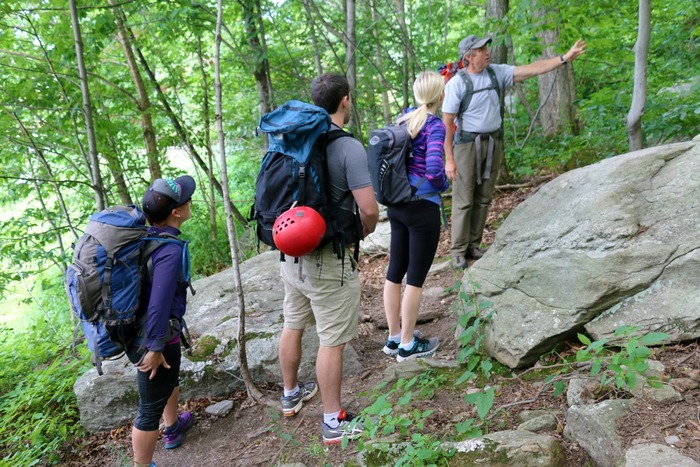 For beginners through advanced hikers, his guidance is second-to-none, leading groups for hiking, rappelling, bouldering or rock climbing. Steve and his team are highly sought after for their emphasis on safety and a keen understanding of the area. So book your tour when you book our lodge. Thundering Falls is the 6th largest waterfall in Vermont. 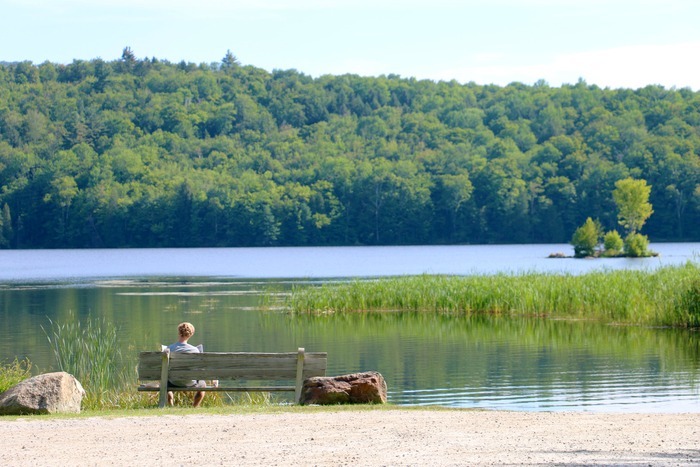 This trail provides an easy 10-minute hike, appropriate for all ages and fitness levels. On the drive in, you’ll pass a recreation area with a swimming pool, basketball courts and playground. It’s a nice spot for a picnic and some play time before or after the falls. Thundering Falls provides the first universally accessible portion of the Appalachian Trail in Vermont, with wheelchair accessible parking on River Road in Killington. The boardwalk makes it possible for persons in wheelchairs to view the falls. You also could bring a small child in a stroller to traverse this portion of the trail. Beautiful wildflowers border the boardwalk, all the way from the entrance to the falls. A small overlook platform is ideal for photos. 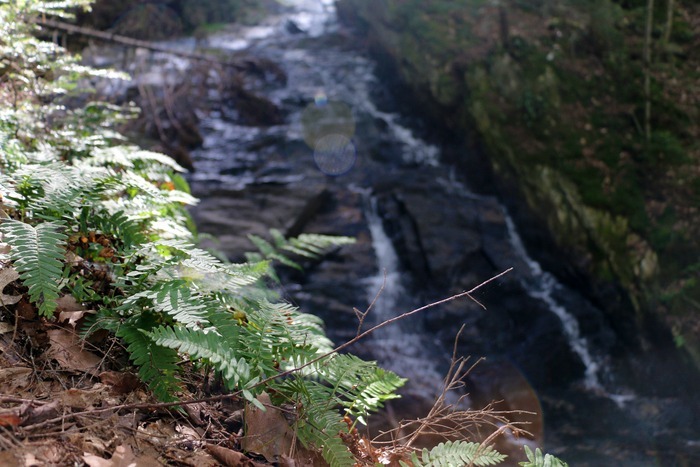 More adventurous hikers can climb to the top of the falls to discover a reservoir. This part of the Appalachian Trail hugs the shoreline across the street from Green Mountain National Forest and Gifford Woods State Park. It’s a great spot for fishing, as well as kayaking, canoeing, paddle boarding or simply enjoying nature. There are several picnic tables and benches where you can sit and ponder the wilderness around you, as well as yet another lovely waterfall. The pond itself is filled with largemouth bass if you’ve brought your rod and reel. One option for hiking is to take the Appalachian Trail from the parking lot, continuing along Kent Pond and across Thundering Brook Road. Return the way you came, or walk to the pond and back along the trail to the fishing access lot. Alternately, take the trail through the state park across the street – a favorite among birdwatchers.